Seakeeper engineers Nick Troche, Bob Lawrie and Mike Gallagher with gold Edison trophy. Seakeeper, Inc., last week won an Edison Award for its Seakeeper 2. The Edison Awards honor excellence in new product and service development, marketing, human-centered design and innovation. The Seakeeper 2 was chosen as a finalist in the Transportation Technology category earlier in the year. Last night it received the category’s top gold award, the highest available. Products were initially chosen by a steering committee and small group of industry experts. The finalists were then submitted to a panel of more than 3,000 judges comprised of senior business executives and academics who then cast ballots for gold, silver and bronze winners. 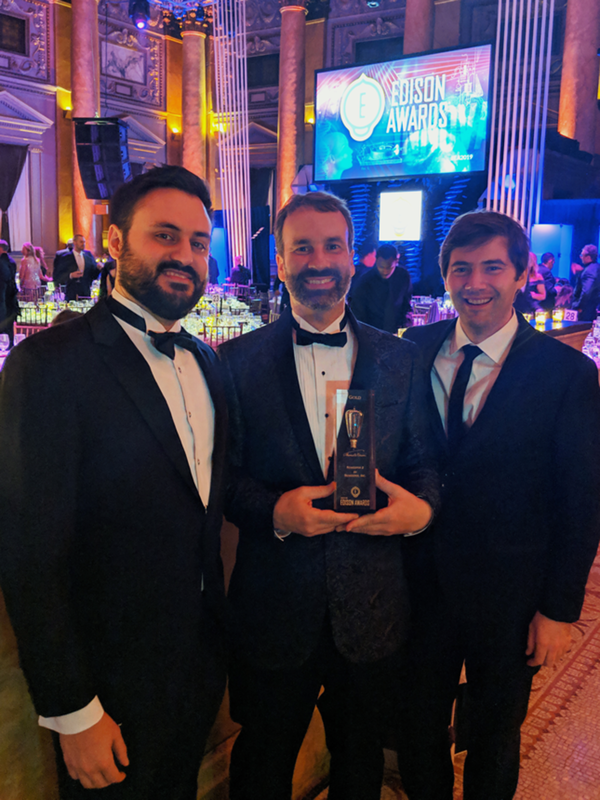 The award was presented at the Edison Awards’ annual black-tie event at the New York Academy of Sciences in New York, N.Y. Events earlier in the day included a Meet the Innovators Forum and an Innovators’ Showcase. Participating companies had the opportunity to connect with other finalists and share their products.